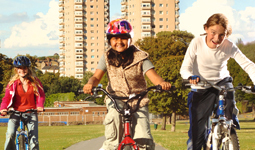 Bikeability is one of Cycling England’s flagship schemes, intended to rescue a ‘lost generation’ of children who would otherwise miss out on the opportunity to learn to cycle safely and responsibly. Launched in March 2007, the programme was created in consultation with leading road safety campaigners and cycling experts - from established scheme organisers to instructors. It is supported by the National Standard for Cycle Training and takes learners through three different levels, awarding development at each stage of the training process. A child will typically start Bikeability lessons once they have learnt to ride a bike, with Years 5 and 6 (10-11 year olds) progressing through to Level Two, and then Level Three at secondary school. However, many adults are also keen to prove their Bikeability - either to learn the basics or refresh their skills. From its early pilot days in 2006, Bikeability has now been adopted by half the local authorities in England, with 40,000 badges awarded in its first year. It is fully backed by the Departments for Transport, Health and Children, Schools and Families, with significant Ministerial and cross-party support. Regular media campaigns like Bike to School Week have maintained the high public profile created by the national and regional launches of 2007, creating powerful marketing opportunities at a local, grassroots level. By 2012, half a million children are expected to have taken part in Bikeability training, setting the wheels in motion for a revolution in English cycling.